Ultrasound induces and promotes the chemical reaction for the polymerization of latex. By sonochemical forces, the latex synthesis occurs faster and more efficient. Even the handling of the chemical reaction becomes easier. Latex particles are widely used as additive for various materials. Common application fields include the use as additives in paints and coatings, glues and cement. For the polymerization of latex, the emulsification and dispersion of the basic reaction solution is an important factor that influences the polymer quality significantly. 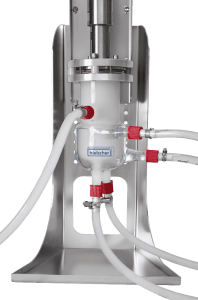 Ultrasound is well-known as efficient and reliable method for dispersing and emulsifying. The high potential of ultrasonics is the capability of creating dispersions and emulsions not only in the micron- but also in the nano-size range. For the synthesis of latex, an emulsion or dispersion of monomers, e.g. polystyrene, in water (o/w = oil-in-water emulsion) is the basis of the reaction. Depending on the emulsion type, a small amount of surfactant may be required, but often the ultrasonic energy provides such a fine droplet distribution so that the surfactant is superfluous. If ultrasound with high amplitudes is introduced into liquids, the phenomenon of so-called cavitation occurs. The liquid bursts and vacuum bubbles are generated during the alternating high-pressure and low-pressure cycles. When these small bubbles cannot absorb more energy, they implode during a high-pressure cycle, so that pressures up to 1000 bar and shock waves as well as liquid jets of up to 400 km/h are reached locally. [Suslick, 1998] These highly intense forces, caused by ultrasonic cavitation, take effect to the enclosing droplets and particles. The free radicals formed under the ultrasonic cavitation initiate the chain reaction polymerization of the monomers in the water. The polymer chains grow and form primary particles with an approximate size of 10-20 nm. The primary particles swell with monomers, and the initiation of polymer chains continues in the aqueous phase, growing polymer radicals are trapped by the existing particles, and polymerization continues inside the particles. After the primary particles have formed, all further polymerization increases the size but not the number of particles. Growth continues until all of the monomer is consumed. The final particle diameters typically are 50-500 nm. 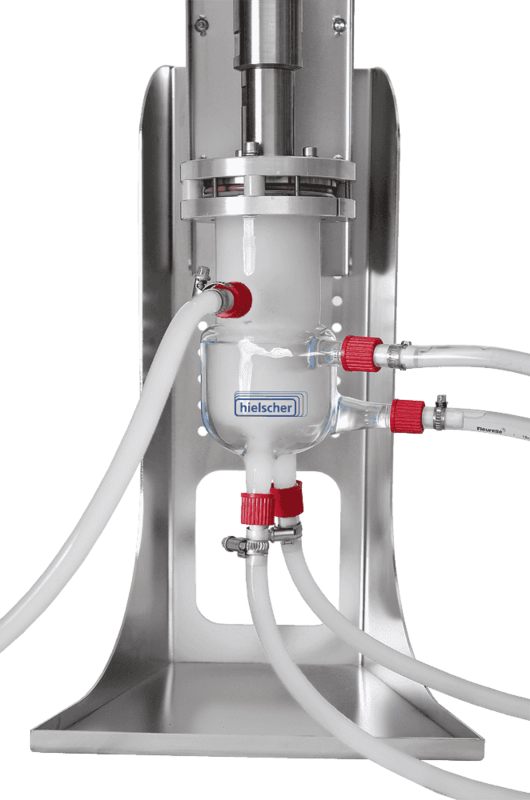 Ultrasonic flow cell reactors allow for continuous processing. A potential effect of latex is achieved by the synthesis of ZnO encapsulated nanolatex: The ZnO encapsulated nanolatex shows high anticorrosive performance. In the study of Sonawane et al. (2010), ZnO/poly(butyl methacrylate) and ZnO−PBMA/polyaniline nanolatex composite particles of 50 nm have been synthesized by sonochemical emulsion polymerization. Hielscher Ultrasonics high-power ultrasound devices are reliable and efficient tools for sonochemical reaction. A wide range of ultrasonic processors with different power capacities and setups makes sure to provide the optimal configuration for the specific process and volume. All applications can be evaluated in the lab and subsequently scaled up to the production size, linearly. Ultrasonic machines for continuous processing in the flow-through mode can be easily retrofitted into existing production lines. Ooi, S. K.; Biggs, S. (2000): Ultrasonic initiation of polystyrene latex synthesis. 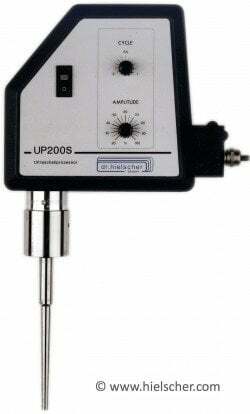 Ultrasonics Sonochemistry 7, 2000. 125-133. Sonawane, S. H.; Teo, B. M.; Brotchie, A.; Grieser, F.; Ashokkumar, M. (2010): Sonochemical Synthesis of ZnO Encapsulated Functional Nanolatex and its Anticorrosive Performance. Industrial & Engineering Chemistry Research 19, 2010. 2200-2205. Suslick, K. S. (1998): Kirk-Othmer Encyclopedia of Chemical Technology; 4th Ed. J. Wiley & Sons: New York, Vol. 26, 1998. 517-541. Teo, B. M..; Ashokkumar, M.; Grieser, F. (2011): Sonochemical polymerization of miniemulsions in organic liquids/water mixtures. Physical Chemistry Chemical Physics 13, 2011. 4095-4102. Teo, B. M..; Chen, F.; Hatton, T. A.; Grieser, F.; Ashokkumar, M.; (2009): Novel one-pot synthesis of magnetite latex nanoparticles by ultrasonic irradiation. Zhang, K.; Park, B.J. ; Fang, F.F. ; Choi, H. J. (2009): Sonochemical Preparation of Polymer Nanocomposites. Molecules 14, 2009. 2095-2110.